Most of us seek various degrees of balance in our daily life. We look for evenness in work and play, solitude and human contact, rest and activity. We try to eat a balanced diet, maintain a balanced checkbook, and keep our balance as we physically move. As people age, physical balance becomes more challenging and the consequences of losing one’s balance become greater. more than 800,000 older adults are hospitalized, most often for head injury or hip fracture. Because older adults are at a higher risk of falling, many retirement communities offer preventative and education programs for residents. At Kendal at Oberlin, for instance, the housekeeping staff are trained to recognize excess clutter and other safety concerns in the home, and a resident-run Safety Committee sponsors programs and projects to prevent falls and report concerns to staff. The Rehabilitation Therapy Department sponsors a monthly health series and devotes at least one program a year on balance and fall prevention. 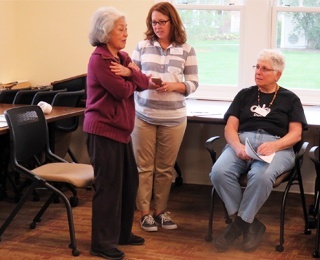 At the most recent balance clinic, entitled “Defying Gravity,” residents participated in several balance screening tests. For instance, a man in his early 70s is at a high risk of falling if he is unable to rise from a chair (without arm rests or using his arms) less than 12 times in a 30-second period. Fear of falling is a major concern because fearful residents often cut down on normal activities, which makes them weaker and more prone to falling. “That happens all the time,” says Kris Koepp, a physical therapy assistant at Kendal, who conducted the clinic. What Factors Increase the Risk of Falling? When we are young, we rely on vision, inner ear, muscles and joints to maintain our balance. “But as you age, you rely more heavily on your vision,” he says. Since vision often declines with age, balance can also become more problematic. foot problems and improper footwear. “People will wear shoes because they are comfortable, but the shoes are old and soles are worn down,” Kris says. Visit your doctor and review medications, any falls (including “close calls”) and health changes. Get regular physical activity, including walking as much as you are able. Remove home hazards and make sure the path from your bed to the bathroom is clear. Wear properly fitted, sturdy shoes with non-skid soles. If you have trouble keeping lace-up shoes tied, switch to Velcro fasteners. Light up your living space: use night lights and keep a flashlight handy. Use assistive devices such as bathroom grab bar and a “reacher” device. If recommended, use a cane and walker. That last tip, to use a cane or walker, is sometimes ignored by older adults because of vanity, Kris says. “They will say, “I really don’t want to be seen with a cane or walker,” he says. But it’s also important that older adults are properly trained to use walking devices or they can actually increase their risk of falling. And keep this in mind, from the National Institutes of Health: most falls happen at home while a person is doing a normal daily activity.